Planeta.com, Nutti Sámi Siida, Guurrbi Tours, TIME Unlimited and Nevada Magazine co-host Indigenous Peoples Week August 6-12, our second annual celebration of social media storytelling about indigenous peoples and tourism around the world. This online unconference is free and everyone’s invited. The objective is two-fold: to raise awareness of indigenous tourism options around the world and to improve digital literacy skills among indigenous tourism providers themselves. Our circle of conversation includes indigenous and non-indigenous peoples around the world. Complete details are online the Planeta Wiki. Planeta.com is offering a special bonus and VIP status to businesses in our World Travel Directory which feature indigenous culture. 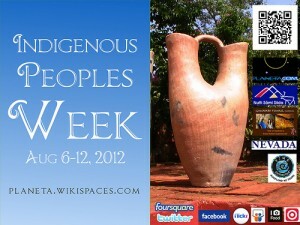 We’ll extend the directory listing free for one month for businesses actively participating in Indigenous Peoples Week. Tour guides and companies not in the directory but which would like to support this event, may apply for a new listing. Ron Mader is a professional journalist and the founder of Planeta.com, the web’s first site dedicated to ecotourism.